When I decided to create a Pocket Video Marketing course some people said to me “What is there to learn? You just hit the record button, it’s simple!” Wrong! A Pocket Video Camera is a powerful communications tool, it’s more than just hitting the record button and shooting yourself against a white wall in your box room. You can easily make bad Videos that look and sound bad or drag on to long or are devoid of creativity. But making good Videos is a skill that I think every Marketer should have as part of their Marketing toolbox. A quote I love is this: “It’s not about the Bow and Arrow, it’s about the archer” (Andy Jenkins – The Video Boss). It doesn’t matter what camera you’ve got if you have great ideas and some technical skills, you can make better Videos than 99% of the planet and good Videos will get your products noticed. So with that in mind here are 3 ways I think you could use your Flip, Kodak, Iphone4 etc. to boost your Marketing efforts. 1. Come out from behind the powerpoint. building a bond with your prospects. I’ve just viewed a new Jeff Walker launch Video. If you follow Internet Marketing you’ll know Jeff’s multi-million dollar earner Product Launch Formula. The first Video was almost entirely real world footage. What I mean by that is you saw him at a whiteboard and then it cut to an on camera interview where he was sat next to one of his successful students talking about how much he had earned from his own launches. There was nothing in the Video that couldn’t have been done on a Pocket Video Camera and it was much more engaging than a back to back Camtasia presentation. Don’t get me wrong I think screencasting is very powerful I just think that breaking it up with real world footage is a great way to engage your buyers even more. Put it this way the Big Marketers test like crazy and they wouldn’t go for the ‘on camera’ route if it didn’t work for them. You don’t need a lot of gear to make these Videos look great, in fact over on my training course page you can see footage that I shot with a Flip camera in a tiny room in my house with lights that cost around £100 a pair! 2. 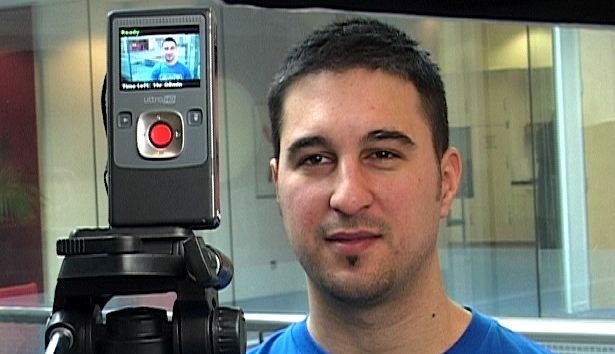 Be a Pocket Video Paparazzi! Take your Pocket Video Camera everywhere. You never know when you will spot something extraordinary. If you do then it could prove a hit on YouTube and you can link it back to your most relevant product. I also advise people to get into the habit of filming their business and personal life. So if you give talks stick the camera on a tripod and get some shots of your presentation to an audience. If you are making good money on the Internet and spend your weekends on your shiny new sailing boat (!) film that. Build up a library of clips and you can use these to make a Video where you show your prospects proof of what you do and how your success effects your lifestyle. If you go to events in your niche, shoot on the fly interviews with participants, upload to facebook, friend your interviewee and use the Video ‘tag’ function to highlight that they feature in the Video. This means the Video will also appear on their wall and get seen by their friends which exposes your brand to new eyeballs. If you target an interviewee that runs a blog even better. You’ll often find that they will embed the Video in their blog too, as it’s so quick and easy for them to do so and beats writing a long post. 3. Get creative with customer testimonials. We all know the power of Customer testimonials, but if you want to take them to the next level offer you audience alternative angles. So say you have a customer, Jane who bought your Marketing product and is happy to record a Video testimonial for you, break it into shorter clips. For example Jane on: “How the product helped me get organised”, “How the product or service made boosted my buisness”, “Why the Webinars were so valuable”. That way you get extra Videos for your YouTube channel and you give visitors to your site a sense of control over the content. Another plus is you avoid making an overlong 10 minute video where you try to pack everything into a single clip. Even better, go the extra mile and show footage of how Jane has benefited from your product on camera to edit over the interview clips. If we get to know Jane more through Video we’ll trust her judgement even more. So let’s see Jane working away at home whilst being able to keep her eye on her baby and winning extra clients all at the same time. That way your Video will stand out from the average customer testimonial and your viewers will stick with the clip right to the end. These are just 3 tips but I hope you can see how powerful your Pocket Video Camera can be. I’ve no doubt, if used well, you can repay the cost if buying it many times over.